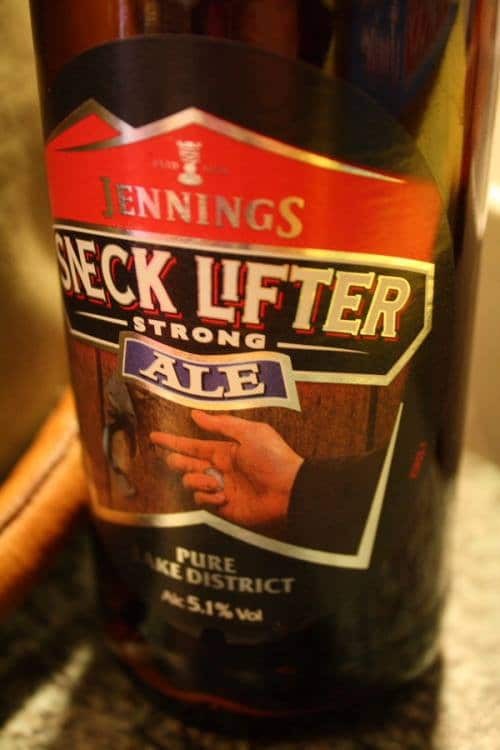 Another classic Lakeland beer, from the recently flood-hit and therefore underwater Jenning’s Brewery in Cockermouth, Cumbria, Sneck Lifter is a deep, dark and rich beer with a coffee flavour and a malty finish. It’s a warming winter beer, with a potent dark red colour. Jenning’s make much of the name. A “sneck lifter” is a man’s last sixpence, which he could use to lift the ‘sneck’, or latch on the pub door and buy himself a pint. The last coin, used properly. Now I'm craving a nice, rich beer. Might be time to break into the Black Butte Porter in our fridge. Snecklifter sounds like something you'd call a dirty old man! ooh, this sounds like a tasty one, and the name is distinctive, so easy to remember as we peruse the brews. There's a few local shops that have a halfway decent import section, so I'll keep an eye peeled for this one!